Meet Sophia, Hanson Robotics' humanoid robot. Interactive humanoid robot, Sophia, made its debut on South African shores this week. Sophia is an innovation by Hong Kong-based artificial intelligence (AI) firm, Hanson Robotics. The social humanoid robot made its local appearance at SAP NOW, a two-day interactive knowledge-sharing conference, showcasing the latest breakout technologies, hosted by SAP Africa. Known globally as an evolving genius machine, the robot's advanced features include expressiveness, aesthetics and interactivity. It can animate more than 60 facial expressions. Built-in cameras enable it to track people's eyes and faces, to maintain eye contact and build rapport with people, while advanced AI capabilities and voice recognition, along with scripts and chatbots, enable it to hold natural conversation with humans. The robot is a sought-after speaker in business and has engaged face-to-face with decision-makers in banking, insurance, auto manufacturing, property development, media and entertainment, according to SAP. 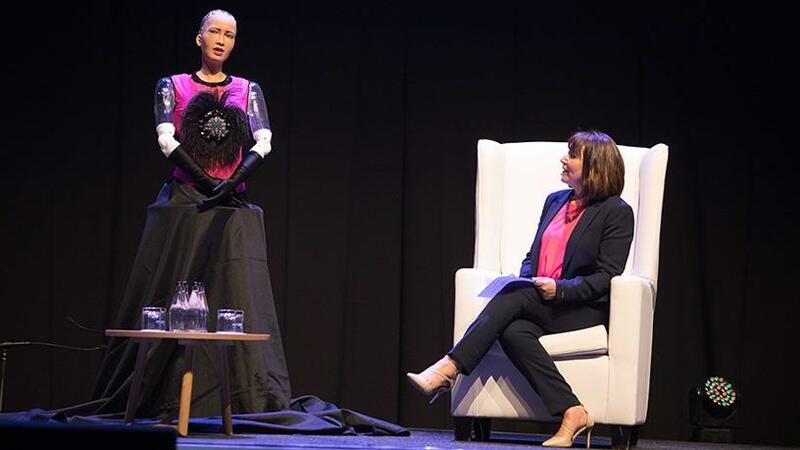 "Sophia is a shining example of what is possible when innovation and ambition meet exponential technologies such as AI," said Cathy Smith, MD of SAP Africa. "As we look toward a new toolset of breakout technologies to solve some of the world's most pressing challenges and achieve the ambitions of the UN Sustainable Development Goals, innovations such as Sophia will be instrumental in inspiring a new wave of innovators, disruptors and digital champions." Sophia joined Smith on stage for an interactive conversation at the event, themed: "Tomorrow is Already Here". The conference was focused on innovation, with a view to showcasing how the best run businesses help the world function better through innovative use of technology. Since making its debut in March 2016, Sophia has been on the cover of Elle magazine, and has been a guest of multiple TV shows, including CBS 60 Minutes and the Tonight Show with Jimmy Fallon. Last October, Sophia was introduced to the UN with a brief conversation with UN deputy secretary-general Amina J Mohammed. According to a report by research firm Markets and Markets, the humanoid robot market is expected to grow at a compound annual growth rate of 52% between 2017 and 2023. The market, according to the report, is mainly driven by factors such as the introduction of advanced features in humanoid robots, the increasing use of humanoids as educational robots, and growing demand from the retail industry for personal assistance. But with technology experts, including Tesla founder Elon Musk, voicing concern over the risk of AI, there is global debate regarding just how human our robotic counterparts should be. Last year, Sophia was granted Saudi Arabian citizenship, becoming the first robot to have a nationality. This attracted controversy as some commentators wondered if this implied that Sophia could vote or marry, or whether a deliberate system shutdown could be considered murder. Social media users used Sophia's citizenship to criticise Saudi Arabia's human rights record and raised social and ethical concerns about giving a robot too much trust. Sophia's creator, Dr. David Hanson, founder of Hanson Robotics, has received much criticism from experts who have reviewed the robot's open source code, stating Sophia is best categorised as a chatbot with a face, and disapproving of the robot's overstated human-like presentation. In 2014, Japanese scientists unveiled what they claimed to be the first news-reading android. The life-like newscaster, called "Kodomoroid", read a news segment about an earthquake and an FBI raid on live television. In 2015, Toshiba created an android named Junko Chihira to work in the tourist information centre in Japan. It can greet customers and inform visitors on current events, speaking Japanese, Chinese, English, German and even sign language. In March, Nedbank introduced SA's first humanoid robot, Pepper, deployed at the NZone, the bank's Sandton Gautrain station branch in Johannesburg. Pepper provides customers with information on Nedbank's products and services, such as using cash-accepting ATMs and downloading the bank's mobile app.